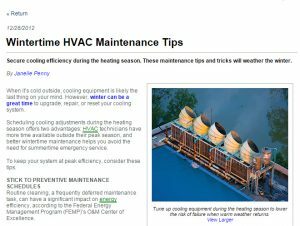 “When it’s cold outside, cooling equipment is likely the last thing on your mind. However, winter can be a great time to upgrade, repair, or reset your cooling system. Your cooling efficiency can be greatly improved before the spring season with an AC maintenance visit during the winter months. By cleaning, lubricating, inspecting, and making small repairs, you can save an extra 15-30% on your energy bills. Your programmable thermostat will also be inspected to make sure it is working properly. If your condenser coil is always dirty and your filters are constantly clogged, your AC system will have a shorter lifetime due to more frequent repairs and lower energy efficiency. At Berico Fuels, our annual maintenance programs will enable you to experience the most energy savings from your system and keep the indoor air quality at a higher level. Enjoy healthier air and minimal repairs with regular AC maintenance. Contact Berico Fuels at 336-496-2509 for your comprehensive and reliable Greensboro AC maintenance service.